The beginning of our about section, where we describe our reasoning and process. Can be seen by scrolling down on the page. The first thing on our web app! Includes a button allowing the user to move directly to recording/rehearsing. Actors always have a lot to memorize, but sometimes no one to rehearse with. Hackers can explain their code to an inanimate object, such as a rubber duck, to work out logic and debug. As computer science majors with backgrounds in theatre, we felt the need to tie together these two disparate, yet oddly similar, worlds. 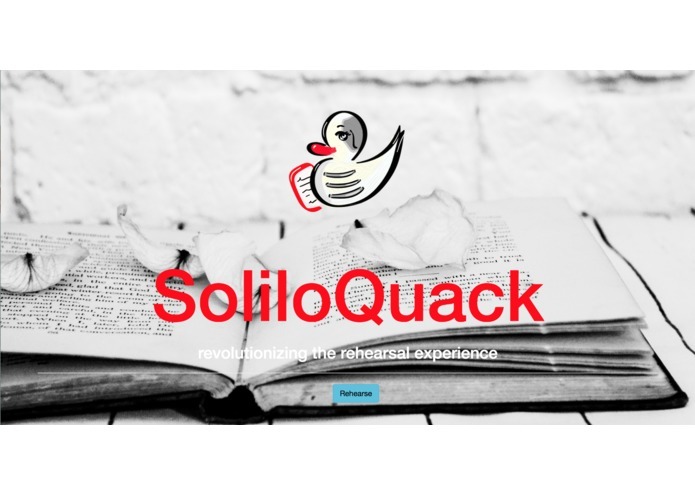 In addition, SoliloQuack is a tool that is completely unheard of, yet needed, for both actors and directors alike. You begin by adding your script, and then reading it to your microphone. Then, our web app will help you learn by showing both the percentage of correct words out of the practiced section and what words you missed. We look forward to enhance this main functionality, by warning users of synonyms they have confused with the script. This will make you the star actor for any picky - we mean artistic - director! My partner and I began by complaining about the difficulties of rehearsing alone, how we wished it existed in past experiences, and just had to get to work fixing it. It was difficult to find the most suitable speech-to-text api, and this presented our group with many struggles. We plan on researching all of our options further, and making our web app as accurate as it can! We had some previous knowledge of these skills, but we greatly built upon them. 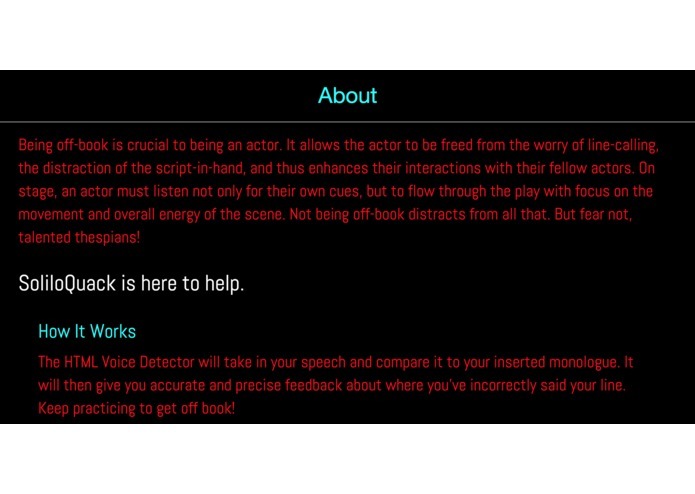 Dialogs: The actor can do scenes with as many actors as they need, and our web app will play the other parts! Accents: We look to detect and give suggestions for the actors' accents and the specific play they are performing. Stage Directions: The uses of our web app can extend to working with your crew as well, to read the important stage directions. In this way the actors can stay focussed on the material! 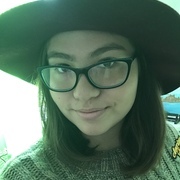 I am a Computer Science Major at Stony Brook University. I enjoy thinking out of the box!